…Readers will immediately be drawn in from the very first page. The book only covers Tuyet’s journey by airplane from Saigon to Toronto, Canada and her adoption to a new family who loves her very much. When Tuyet is flying to Canada, another orphan, Linh, gives her some advise. Whenever someone asks you something in English, answer, No. That will stop them from doing what they were going to do. The last three chapters are most touching as we learn just how patient Tuyet’s new family is as they learn how to communicate with each other. (They do not speak Vietnamese) Some of the changes in Tuyet’s life were difficult. For instance, Tuyet was used to sleeping with all the other orphans on the floor at the orphanage, she is unable to adjust to sleeping alone in a bed in her own bedroom. Historic black & white photographs, including some of Tuyet, enhance the reading experience. In a historic note, Skrypuch briefly explains the rescue operation. In her Author’s note, we learn that Tuyet currenly lives in Skrypuch’s hometown of Brantford, Ontario. It is great to see Tuyet as a grown up woman. 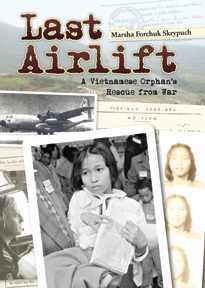 On October 29, 2012, Marsha Skrypuch and Tuyet Yurczyszyn (Nee Son Thi Anh Tuyet) visited Blessed Kateri School to talk about Last Airlift: A Vietnamese Orphan’s Rescue from War and One Step at a Time: A Vietnamese Child Finds Her Way, two non-fiction books that Marsha wrote about Tuyet’s dramatic childhood. The event was such a success that it was featured in the London District Catholic School Board’s Spotlight newsletter for November, 2012. Click here and scroll down to the middle of the newsletter to read the story and see some great pictures. In this interview Marsha Forchuk Skrypuch discusses Last Airlift, its upcoming sequel, and the merits of children’s non-fiction on Nash Holos Ukranian Roots Radio in Vancouver, British Columbia. …Tuyet becomes a heroine of her own story, using her fortitude, observations, and humanity to navigate the new territories outside of the orphanage and to make herself fit in.